*************************************************************************************************Attention High School students: The Career Academy (TCA) is hosting a Career Explorations Fair for 9th, 10th & 11th graders and their parents to learn more about top career options. It’s never to early to start thinking about career choices for students. The Career Academy offers 11th & 12th graders experiences in hands-on learning in one of 20 career pathways. 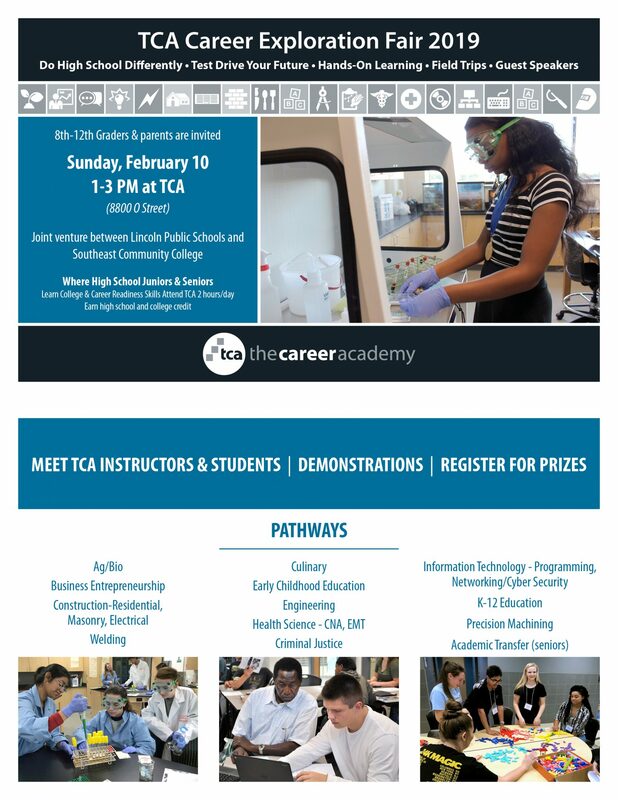 Attend the TCA Career Explorations Fair anytime between 1:00 – 3:00 PM on Sunday, February 10 at 88th & O. Park in the lower south parking lot at SCC, Register for prizes, meet TCA students and instructors and see how “doing high school differently” can make a huge difference in your future success. We hope to see you there! Attached is the information for the 2019 Girls State Session. Dates are June 2-8, 2019. Please have the Declaration of Interest Forms, Application and Pledge to the Counseling Center no later than January 30, 2019. Attached is information about the 2019 session of American Legion Cornhusker Boys State. Dates are June 2-8, 2019. Please have the Declaration of Interest/Resume & Application to the Counseling Center no later than January 30, 2019.